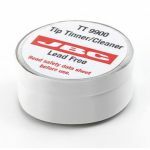 Howard Electronics offers Lead Free TT-A Tip Tinner by JBC Tools. The JBC Tools TT-A Tip Tinner is a chemical system to clean and retin the tip at te same time. TT-A JBC Tools Tip Tinner is a speedy and effective product for cleaning and re-tinning de-wetted soldering irons that cannot be re-tinned by sponges, pads or rosin-cored solder wire. Purchase a JBC Tools TT-A Tip Tinner sold by Howard Electronics Today!